Wether you are lost in the woods trying to save a bear cub stuck in a tree, or defending earth against alien invasion, git is a tool of choice to collaborate and save your progress to come back in time and save the day again if needed. Though using git (and GitHub) can be quite intimidating or look like dark magic. We will gently introduce you to simple git concept, from Just memorize these shell commands, to some dark voodoo allowing you to do a 66 way Cthulhu merge. It is true that actual manual page, can be hard to distinguish from markov-chain text, but you probably don’t need to dive into it now. We’ll start pretty soft. Make sure you have git installed, and that it works. We’ll make sure you know the basics to already use git on your own, and to be ready to collaborate. 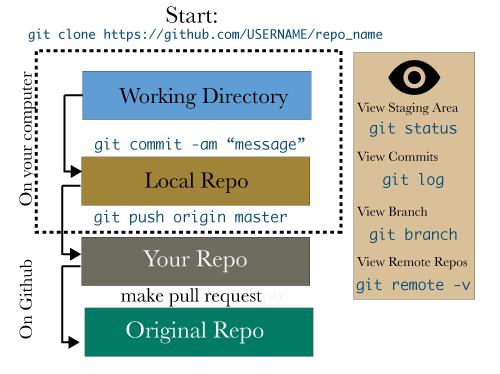 What is the difference between github and git? A lightweight version control system to track changes made to a project through time. There are many ways to use Git on your computer. Command line is the most popular way to use git, therefore you can get help easily. If you know how to run the command line version, you can probably also figure out how to run the GUI version, while the opposite is not necessarily true. Dont let your inexperience with command line stop you, you only need to learn the very basics of unix to use git. While Git stands alone as a system, Github is a website that hosts your project and Git history. You can use for collaboration, back-up, sharing, and learning. Github is just one of many places to host repositories. The benefit of Github is that it is the most popular and has many tools to make it easy and fun to use. The main downside is that it does not allow free private repositories. 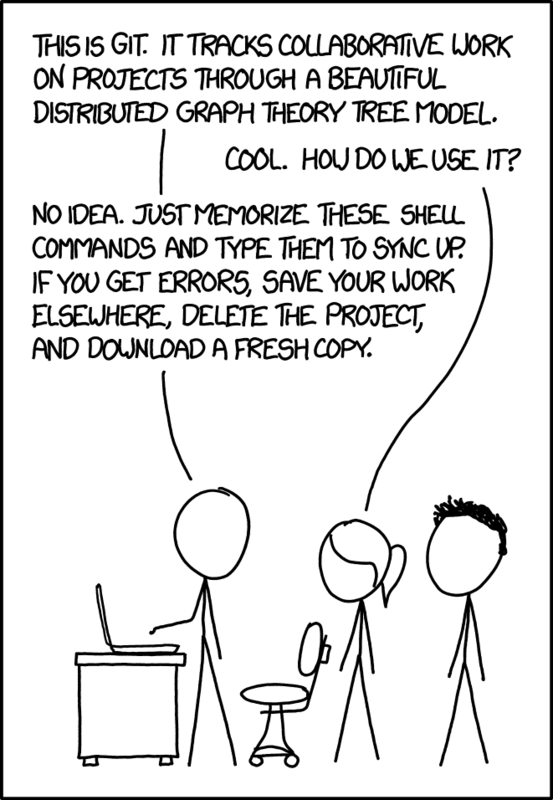 Collaboration - Git allows groups of people to work on the same documents (often code) at the same time, and without stepping on each other’s toes (from tryGit). Learning git well is hard, but I would say only 5% of people who use git know exactly what they are doing. Why is learning git hard? Git is a complex with many ways to approach using it. Try to have git installed on your laptop before coming to the hacker within. If you are on windows we recommend git-bash, which should be bundled with GitHub for Desktop. Git should be bundled on recent Macs, you can also install it with GitHub for Desktop, or Homebrew. User of linux probably already have git installed as well , or know how to install it with your favorite package manager. In your terminal, execute git clone https://github.com/YOURUSERNAME/THW_attendence. Make sure you replace “YOURUSERNAME” with your Github name. For example mine is iamciera. Now, you need to check what branch you’re in git branch. Make sure you are on the master branch. Now we are ready to edit the file. Open the README.md file and add your name to the list. Add under the header of the letter your first name starts with. This is so we avoid merge conflicts. Navigate in your browser to: https://github.com/YOURUSERNAME/THW_attendence and press the pull request button. Narrow down a bug ? Let’s bisect. Want to hide your mistakes ? rebase/amend. Have erased a mistake from history that was not a mistake ? reflog to the rescue. Git is no fun without all the configuration option and tricks that make your life easier. Checkout a PR by it’s number ? oowee! Diff words instead of lines ? Can doooo ! Local and global gitignore ? Sure ! Even if it looks insanely complicated to operate and and partly to keep intergalactic travelers from panicking we’ll discuss what to do when things go south. Long story short, keep calm and commit -A (and push) if you are really scared. Nothing is ever lost. What happen in case of broken whatever ? If you are in “Detached head state”, “merge conflict”, or anything else ? We got you covered ! Eisen Lab Github: Collaborate with lab members. You can train in your browser ! then echo -n "| (• ︵•)| (❍ᴥ❍ʋ) "
else echo -n "| (• ‿ •)| (❍ᴥ❍ʋ)"
else pwd | sed -e "s|.*/\(.*/. *\)|\1|"